Divination is the reading of signs or symbols in order to obtain guidance about current situations and future events. Many different methods of divination were used in the ancient and medieval worlds, including the observation of animal behaviour, the movements of stars and planets, the casting of lots, and inspired oracular utterances. These methods were understood as ways of communicating with the world of spirits and unseen powers. From a modern psychological perspective, divination represents a subtle means of tapping the wisdom of the unconscious mind. An ancient Chinese system of divination, the origins of the Book of Changes (I Ching) are steeped in myth and legend. The book is certainly one of the oldest in the world, dating back to about 1000 BCE. It is based on an even older shamanistic oral tradition. The book was used for divinatory purposes for hundreds of years before it was finally codified during the Han dynasty (206 BCE - 220 CE). At the same time, various commentaries were added to the basic text. The I Ching has been in continuous use up to the present day. Its intelligent, profound, sophisticated and often uncannily accurate readings have recommended this system of divination to many westerners, including the psychologist C.G. Jung, the physicist Wolfgang Pauli, and the writer Hermann Hesse. The central idea behind the I Ching is that of flux or change. All things, including human affairs, are understood to change through time - they are born, develop, decay, die and are reborn in some new form. By studying these changes, we can recognize significant patterns of change (e.g., night and day, the phases of the moon, the seasons of the year, the stages of human life). Change also involves relationships between opposites. The two most basic opposites are the principles of Yang and Yin. Yang corresponds to active, creative, expansive force. Yin corresponds to receptive, mutable, contracting form. All change can be understood in terms of the relationship between Yang and Yin.When Yin and Yang are in balanced relationship, then life is harmonious. When we follow a harmonious and connected path through life, then we are said to live in accordance with the Tao. There is also a reality beyond Yin and Yang. This is T'ai Chi or Taiji (The Absolute), beautifully represented by the Taijitu (Diagram of the Absolute), more commonly known in the West as the Yin-Yang symbol. Yang and Yin are represented in the I Ching by unbroken and broken lines. When using the I Ching oracle, these lines are used to create Hexagrams (figures made up of six lines). Hexagrams are always constructed and read from the bottom to the top. Each line in a hexagram can be either Yang or Yin. The various combinations give rise to 64 different hexagrams. For the purposes of the divination, each different hexagram (and every line in a hexagram) has its own particular oracular meaning. Each hexagram is also understood as composed of two Trigrams (figures of three lines). A hexagram's two component trigrams (known as 'Above' and 'Below' are made up of the top three lines (4,5,6) and the bottom three lines (1,2,3) of the hexagram. These indicate the outer (above) and inner (below) aspects of the situation described in the hexagram. There are 8 possible trigrams. Each of these also has a traditional meaning. Hexagram 22: Adornment is made up of Mountain (above), and Fire (below). Additional trigrams, made up of lines 2,3,4 and 3,4,5 of a hexagram, are also understood to form a Nuclear Hexagram that gives further insight into the meaning of each reading. The nuclear hexagram for Hexagram 22: Adornment is therefore made up of Thunder (upper) and Water (lower). The nuclear hexagram is believed to indicate something of the original hexagram's latent or hidden potentials. The nuclear hexagram of 22: Adornment) is 40: Liberation. The interpretation of nuclear hexagrams will become much clearer when you use the Advanced I Ching Oracle. Each hexagram also has one or two governing or Ruling Lines. These are pivotal in the structure and dynamics of the hexagram and generally represent auspicious qualities. Most commonly, line 5 is a ruler but sometimes other lines take precedence. For Hexagram 22: Adornment. the ruling lines are 2 and 6 (indicated by asterisks). You begin your consultation by formulating a question. Alternatively, with the Advanced I Ching Oracle, you can click DAY for an instant daily I Ching reading (no question needed). You can ask questions about situations in your own life, or about general situations, such as social, business or political events. 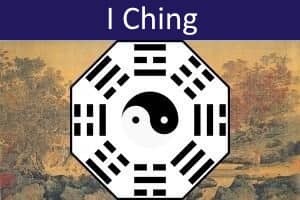 You should NOT use the I Ching to ask questions on behalf of another person (although, of course, you can consult the oracle about your own relationship with other individuals). Spend some time, reflecting on your thoughts and feelings about the situation, before formulating your question. Your question should be clear and precise. Do not assume that the oracle knows what you have in mind. Vague or ambiguous questions will get confusing or dismissive answers. 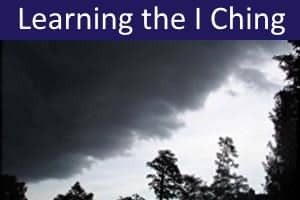 Do not ask whether specific events will occur (the I Ching is not intended for making predictions), but focus instead on how things will affect you, on how you should behave in the situation, or on what aspects are operating in events. If you do not get a clear answer to your initial question, then more focused follow-up questions are advised. Most importantly, you should approach the I Ching with an attitude of openness, honesty and respect. The I Ching has a very definite 'personality' of its own, as you will soon learn. 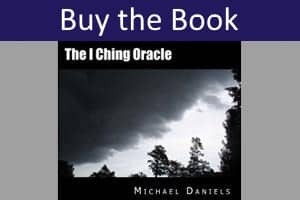 If you use the I Ching in a trivial or inappropriate way, you are not only wasting your own time but you risk being confused or reprimanded by the responses you receive from the oracle. How can I learn from the events of today? Should I consider psychotherapy at this time? How should I respond to John's invitation to spend the weekend with him? How will moving to Chicago affect the family? What are the prospects for my business partnership with Susan? What is the best way to ask for a raise in my salary? How will the planned surgery affect the way I feel about myself? How is my spiritual development progressing? How will political negotiations proceed at the forthcoming summit? If you wish, you can type in your question (this is not sent to us and remains completely private). You can also choose your area of inquiry, although this is also optional (it does not affect the reading given). Traditionally, the I Ching hexagrams are constructed by throwing three coins six times, or by following a complicated procedure that uses 50 yarrow stalks. Both methods are based on the assumption that the 'random' fall of the coins or division of the sticks in some way reflects the nature of the inquiry. From the perspective of Jungian Psychology this happens due to meaningful coincidence and an acausal connecting principle known as synchronicity. The coin oracle is the most commonly used, simply because it is quicker. However, the yarrow stalk procedure is the more ancient, and is considered by many people to be more authentic. This is because the yarrow stalk procedure is more consistent with the underlying theory of the I Ching. With the advent of personal computers, software is increasingly used to simulate the traditional methods of casting hexagrams. This has the advantage of convenience, speed and computational accuracy. It may seem strange to use a computer for this purpose, but in principle there is every reason to suppose that synchronicity operates just as readily in this way. Many people's experience is that computerized I Ching readings are just as valid and useful as those made using more traditional methods. 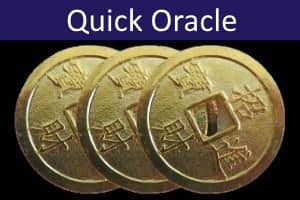 Quick I Ching Oracle uses a simulation of the coin method to generate a basic reading. Advanced I Ching Oracle gives the choice of Coin, Yarrow Stalk, or 'Plum Blossom' methods. The Plum Blossom method uses your computer's current date and time to generate a reading (this changes every minute). You may prefer to use the Plum Blossom method if it seems that the present moment is somehow significant to your inquiry. 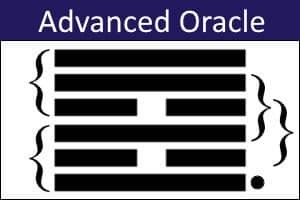 Advanced I Ching Oracle also gives an analysis based on both original hexagrams (manifest circumstances) and nuclear hexagrams (latent potentials). To cast the oracle (all methods), hold your question clearly in your mind. When you feel the time is right, click the GO button to cast the hexagram(s). You may have your own way of getting into the right frame of mind for the divination. Some people like to use a simple meditation or some kind of personal ritual. The Coin and Yarrow Stalk methods give 64 x 64 = 4096 possible readings. In contrast, the Plum Blossom method gives only 64 x 6 = 384 different readings (because, with this method, there will always be exactly ONE changing line). The reading for the first hexagram indicates the basic current situation and immediate advice. In many readings (but not all), the first hexagram changes into a second hexagram, due to the fact that one or more of the lines may change from a Yang to a Yin (or vice versa). If this is the case, you next interpret the reading for the changing lines. These give an indication of the dynamic or changing features in the situation. The changing lines should be read in sequence from bottom to top. If a line appears to contradict the advice in the basic reading, the changing line takes priority. When the various lines give different advice, these may refer to a sequence of events, or may indicate genuine tensions in the dynamics of the situation. If a line is marked with an asterisk (*), this shows a ruling line which should be given particular emphasis. Finally, you read the second hexagram. This indicates the way in which the situation may develop, or advice for the future. If the reading has no changing lines, you will have no second hexagram. This implies a situation that is fixed or static. In order to get full value from the reading, you should play with the ideas that are suggested, relating them to your situation and considering various interpretations. This should be done lightly and intuitively, allowing your unconscious mind to suggest connections, associations and possible meanings. If you wish, you can also consult various books on the I Ching that give more detailed readings of the hexagrams (see Bibliography). With the Advanced I Ching Oracle, the original reading (which indicates the manifest circumstances relating to the question) is supplemented with an analysis of the nuclear hexagrams. The reading for these is approached in the same way as before, but this time the indications refer to latent potentials in the situation. These should be considered alongside the manifest circumstances to add depth and subtlety to the interpretation. 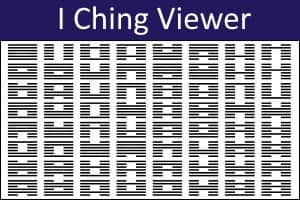 I Ching Viewer is a sophisticated learning and research tool that enables you to examine various hexagram combinations and their associated readings. Simply click on the trigrams, hexagrams, hexagram lines, or changing lines to view the various readings that are possible. Analyses of the nuclear hexagrams (to four levels) are also provided. Is the I Ching truly accurate? 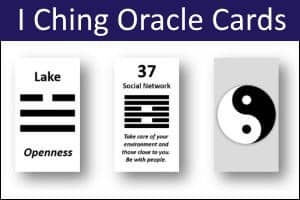 Explore this with our I Ching Oracle Test and Trainer. This enables you to learn and test your ability to determine the I Ching readings for your questions. To do this, a blind reading is cast for TWO different questions. You then have to try to identify which reading corresponds to which question. By chance, you should be successful half the time. If you are able to consistently identify the correct readings, then this is evidence that the I Ching readings are not simply arbitrary, but may genuinely relate to the question posed. If you carry out a number of experiments using the Test and Trainer, you can carry out a statistical analysis of your data using our free online Hit-Miss Calculator. 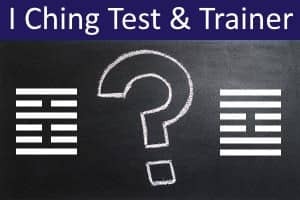 Click here for more information about I Ching Oracle Test and Trainer. 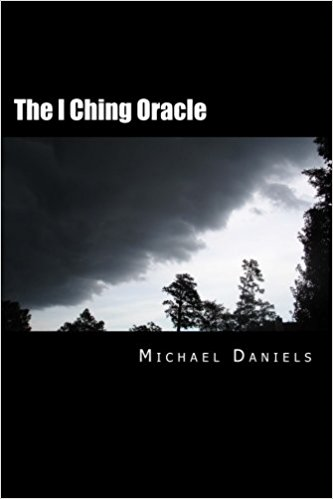 The Quick Oracle uses a modern text written by Michael Daniels PhD, based on a reading of several English translations and interpretations of the I Ching, and on more than 40 years personal experience with the oracle. The text is not itself a direct translation from the Chinese. It represents an attempt to encapsulate the basic psychological ideas behind the hexagrams and changing lines, while avoiding the archaic and often confusing imagery found in many books. This text attempts to be accurate and faithful to the spirit and personality of the I Ching, but has been creatively adapted. It is written in a modern idiom, and in such a way that it will offer clear guidance for people who wish to use the oracle to answer questions relating to personal situations (hence the references to "You" in many readings). As a result, interpretations may need to be adjusted when consulting on wider social or political issues. The classic scholarly English translation by the sinologist James Legge. This was originally published in 1882 and is now in the public domain. The classic oracular translation by Richard Wilhelm. This was originally published in German in 1927 and this work is now in the public domain. The well-known English translation of Wilhelm's I Ching by Cary F. Baynes is, however, still in copyright. In its place we are pleased to present a new English translation of the Wilhelm text which has been specially undertaken for our own I Ching Oracle. Note that the text of this new English translation is copyright © psychicscience.org. The mnemonic versified interpretations of Legge's translations by occultist Aleister Crowley (unpublished and believed to be in the public domain). For ease of comparison, you can switch between interpretive texts at any time. Blofeld, J.E.C. (ed.) (1991). I Ching: The Book of Change. Arkana. Crowley, A. (nd). The Yi King: A New Translation of the Book of Changes with a Commentary by the Master Therion (Liber CCXVI). Huang, A. (1998). The Complete I Ching: The Definitive Translation by the Taoist Master Alfred Huang. Inner Traditions Intl Ltd.
Huang, A. (2000). The Numerology of the I Ching: A Sourcebook of Symbols, Structures, and Traditional Wisdom. Inner Traditions Intl Ltd.
Jung, C.G. (1973). Synchronicity: An Acausal Connecting Principle. Princeton University Press. Karcher, S. (2000). New Perspectives: I Ching. Element. Legge, J. (trans.) (1896 / 1975). I Ching: The Sacred Books of China: The Book of Changes, 2nd Edition. Dover Publications. Loewe, M. & Blacker, C. (eds.) (1981). Oracles and Divination. Shambhala. Ritsema, R. & Karcher, S. (trans.) (1995). I Ching: The Classic Chinese Oracle of Change. The First Complete Translation With Concordance. HarperCollins. Tan Xiaochun, (illus.) & Koh Kok Kiang (trans.) (1993). The I Ching: An Illustrated Guide to the Chinese Art of Divination. Asiapac. Von Franz, M-L. (1980). On Divination and Synchronicity: The Psychology of Meaningful Chance. Inner City Books. Wilhelm, R. & Baynes, C.F. (1967). The I Ching or Book of Changes, 3rd Edition. Princeton University Press. Wing. R.L. (1979). The I Ching Workbook. Doubleday.